As European cities grew and became denser, crime started to grow. The nighttime streets became crime-ridden and dangerous. In order to help deter the growing level of crime watchmen were hired to patrol the streets. London citizens were even required to hang out lanterns and place a burning candle in each window facing the street. 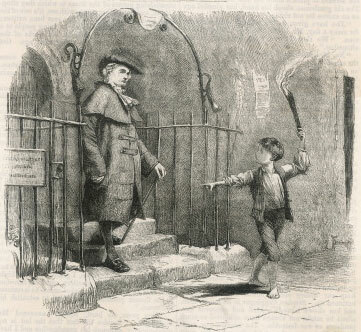 For a farthing there were young boys called “Link boys” that would carry torches and accompany citizens through the streets to their destinations. These practices continued with limited success until gas street lighting was gradually introduced in the early years of the 19th C. Publications of the time reported that for the first time nighttime street crime was greatly diminished after the installation of gas street lighting. It had been known for much of the 18th C. that inflammable gases could be produced from most combustible materials, such as coal and wood through a process of distillation. 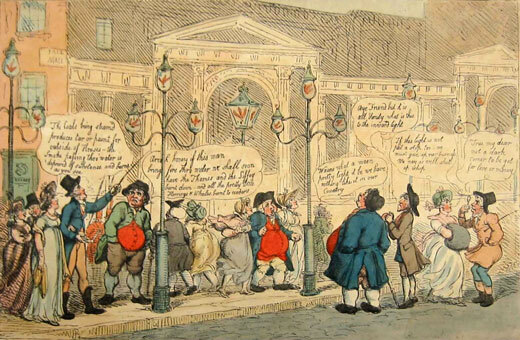 But it wasn’t until a German émigré named Frederick Winzor (later changed to Winsor) demonstrated a viable system by setting up and illuminating a number of street lights outside his home in Pall Mall in 1807 London. In 1812 he was granted permission to create England’s first gas utility named the Gas Light and Coke Company. Gas soon proved itself to be less expensive and have better luminous characteristics than any of the traditional flame sources (candles, whale oil, etc.). As a result, by 1825 utilities had sprung up all over England so that almost every city with a population over 10,000 had a utility. 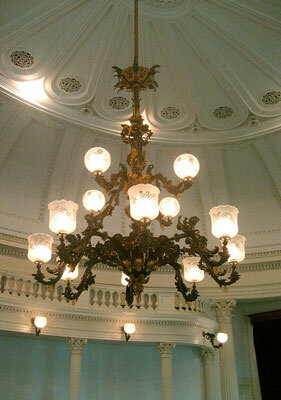 Initial uses were for street lighting and for commercial users, but eventually spread to residential users as well. The technology soon spread across Western Europe and made its way to North America. Gas light was first introduced to the United States in 1816. These early utilities operated as all-inclusive operations that provided everything a client would need to install gas lighting. They would create the gas from coal in large central plants, store it until needed, install the piping from the plant to the building, install the piping in the building itself, install a metering system to monitor gas flow, and finally work with the building owner to locate and install the gasoliers in the building. The first gas burners, or gasoliers were little more than holes in the iron gas pipe, but they corroded rapidly. Early technical developments focused on the introduction of brass fittings, called jets, which would carefully shape the flame to maximize its luminosity. The technology eventually reached its zenith with the development of the gas mantle. In 1882, the Austrian chemist Carl Auer von Welsbach developed the incandescent mantle. He had been experimenting with several rare-earth elements and noticed that many would incandesce when heated. Seeing its applicability to lighting he created a webbing of vegetable fiber and then soaked it in a solution of thorium and a variety of rare-earth chemicals. Once the webbing dried he incinerated away the webbing leaving a skeleton of the rare-earth chemicals. He then installed them in a lamp where the heat from the flame caused it to incandesce very brightly. Lamps with the gas mantles would produce a candlepower of 60 to 70, where a standard gas flame would only produce a candlepower of 6 to 10. The benefit of gas lighting over traditional oil lamps was dramatic. With a candlepower output of 6 to 7 times over standard oil lamps the overall level of illumination in a space was greatly enhanced. When multiple gasoliers were used in a single space the distribution of light became more even and the light level brighter. But it created a number of challenges as well. Unlike portable oil lamps, fixed gas lighting tended to make the arrangement of furniture much more static. Where previously furniture might be arranged around the perimeter of a room and then rearranged as needed, the permanent installation of the gasoliers required the arrangement of furniture to be anticipated. For the first time in history there had to be coordination between the lighting and the furniture arrangement. In many ways this can be seen as the infant stage of lighting design.